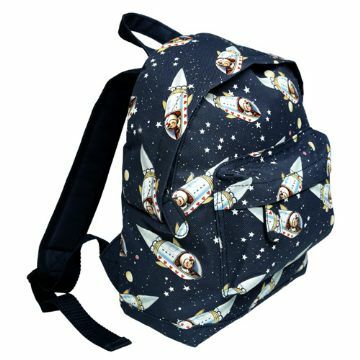 Spaceboy mini backpack - spacekids - space toys, dressing up costumes, kids spacesuits, astronaut food, cool space stuff! Midnight blue spaceboy mini childrens backpack, perfect for school, picnics and hiking. Handy carring handle and adjustable padded shoulder staps. Padded back, zipped main compartment and small front pocket for easy access. To clean, wipe with a damp cloth. WARNING ! Keep away from fire.